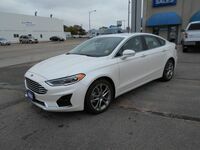 The 2019 Ford Fusion is a favorite among midsize-sedan shoppers at Wolf Auto Center in Kimball, NE. This Fusion has upgraded its safety features with the all-new Ford Co-Pilot360™ suite, designed to always be one step ahead of you while on the road. With an impressive lineup of engine options and feature-filled trims, it’s no wonder why this Ford is such a favorite among Kimball-area drivers. The 2019 Ford Fusion is available in five athletic trim levels – S, SE, SEL, Titanium, and Sport – along with hybrid and plug-in options. This Fusion features updated designs, giving it a fresh new look along with added interior features. Are you curious to know how well this Ford stacks up against the competition? Continue reading this 2019 Ford Fusion vs 2019 Toyota Camry comparison to see why so many drivers are choosing the Ford Fusion. What are the differences between the 2019 Ford Fusion and 2019 Toyota Camry? The 2019 Ford Fusion provides drivers with knockout performance and top-of-the-line features that are sure to knock out the competing 2019 Toyota Camry. The Fusion wears an affordable price tag of $22,840 while the Camry wear a higher tag of $23,845. The 2019 Ford Fusion S is powered by a 2.5-liter iVCT engine under its hood that is paired with a six-speed SelectShift® automatic transmission. This combination achieves 173 horsepower and offers an EPA-estimated fuel economy of 21 city/31 highway MPG. With a 16.5-gallon fuel tank in FWD models, the Fusion offers a driving range of 346.5 city miles – 511.5 highway miles. Drivers looking to get behind the wheel of an AWD Fusion will have a higher driving range of 378 city miles – 558 highway miles with its 18-gallon tank. The competing 2019 Toyota Camry is powered by a 2.5-liter 4-cylinder engine paired with an 8-speed automatic transmission that generates a comparable amount of horsepower. Drivers will have 16 cubic feet of space in the trunk of their Fusion, giving them enough room for any weekend getaway. Inside the Fusion’s cabin is a 4.2-inch driver configurable LCD display located in the instrument cluster along with a rotary gear shift dial that makes switching gears swift and easy. The competing Camry offers a smaller cargo area with just 14.1 cubic feet of space and features a similar 4.2-inch TFT Multi-Information display. The 2019 Ford Fusion will keep you and your passengers safe on the road every time you get behind the wheel. The standard Ford Co-Pilot 360™ system is at work each time you head out on the road, activating features like Auto High-Beam Headlamps, BLIS® with Cross-Traffic Alert, Lane-Keeping System, Pre-Collision Assist with Automatic Emergency Braking, and more. The 2019 Fusion will give you your safest drive yet, letting you drive with confidence every time.